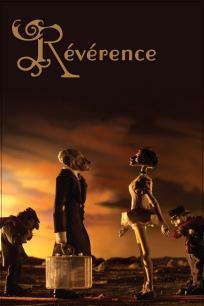 Director Patrick Bouchard’s 2007 animated film Subservience is perhaps the most thought-provoking short I’ve seen thus far, a pointed attack on class system that explores the callousness of the upper crust, as well as their vulnerability when left to fend for themselves. Story-wise, there isn’t much to it. An aristocrat walks through a barren wasteland followed by his servant, whose job is to ensure his master’s feet never actually touch the dirt (the poor guy does this by continually rolling and unrolling two short pieces of red carpet, moving one to the front while his master is on the other). After some time, they come to what we assume was a pre-arranged meeting place, where the aristocrat encounters a pretty young woman ( with a servant of her own) standing on a patch of red carpet much like his. The two meet, exchange pleasantries, and head off into the distance together, all as their servants work tirelessly alongside them. But when the woman accidentally drops her handkerchief, it leads to a catastrophe that neither the aristocrat nor his female companion ever considered. Produced with stop-motion, Subservience (also released as Reverence in areas of France and Canada) features some intriguing visuals, with characters that, while certainly not attractive, are always interesting. Yet even more powerful than the imagery are the emotions the movie stirs in its audience, the anger at seeing two supposedly “refined” people mistreat their “lessers”, and the frustration that comes when they (and we the audience) realize just how helpless these two “important” people are when left on their own. In 8 short minutes, Patrick Bouchard hammers his point home. He has created one hell of a movie here.